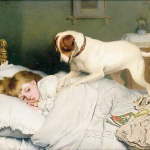 Charles Burton Barber (1845-1894), not to be confused with the landscape painter from Liverpool with the same name who died in 1854, was primarily known for his charming paintings of children with animals. He was born in Great Yarmouth in Norfolk and entered the Royal Academy when he was 18. Two years later he was awarded a silver medal for drawing and first exhibited at the Academy in 1866. He continued exhibiting there until 1893. His works were also included in exhibits at the Fine Art Society, Manchester City Art Gallery, Royal Institute of Oil Painters and the Walker Art Gallery. Barber's greatest love was painting the natural world, deer in particular. He would have been perfectly content to hone his craft painting landscapes which included powerful stags and graceful does. Had he not had a family to support, he may have stayed on that path and not produced the many wonderfully charming portraits of children and their pets that we have come to love. Barber is said to have been a quiet man who valued his privacy. Unlike other artists, when he received commissions from Queen Victoria, there was no attempt by the artist to parlay those commissions into a larger reputation for himself. Other than the income from the commissions themselves, he earned no other income from her patronage. Queen Victoria and her daughter Beatrice had a particular fondness for animals. The Queen had a number of collies, dachshunds and Pomeranians. In the 1870′s, the Queen commissioned Barber to paint a series of portraits of her dogs to honor and memorialize her beloved pets. One of the more famous pieces is of the Queen, Beatrice, three collies and a dachshund at Windsor. He painted portraits of a number of the Royal family pets including Marco, Noble and others belonging to the Queen; Watts, Spot and Oswald for Beatrice; and for the prince, who would later become King Edward VII, Barber painted the portraits of Beattie and Fozzy. 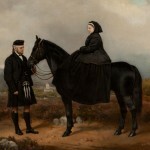 He also painted Queen Victoria sitting upon her horse with John Brown holding the reins. Barber's last painting was for the Queen. It was a portrait in which she is shown seated in her pony carriage with several of Prince and Princess Henry of Battenberg's children and surrounded by dogs. Clark, John Brown's replacement, appears along with an Indian servant as well. Some of Barber's friends and family admitted after his death that they had believed it would be either his last painting or the last one painted for the Queen. At least five of his works remain in The Royal Collection, where they are held in trust. 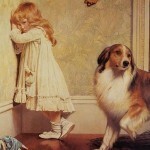 Unfortunately, under English law, photographs of these paintings, which would be considered in public domain in the rest of the world, remain licensed by the Royal Collection and therefore will not be included on The Famous Artists collection of works by Charles Burton Barber. Sir Edwin Landseer factored greatly in Barber’s success. Barber admired Landseer’s work and was thought to be inspired by it. Barber shared Landseer’s love of the outdoors and started his career by emulating Landseer’s work of painting outdoor scenes, including the deer he so loved. Upon Landseer’s death, Barber was chosen as the Queen’s court painter. Unlike Landseer, the animals painted by Barber exhibit characteristic animal-like expressions rather than more human ones. Yet, the animals he painted still convey expressions many pet owners liken to human emotions including excitement, sadness, longing and protection. Barber defied convention by keeping his animals with their own features but in doing so carved out a niche for himself. Speaking of carving, did you know that Barber was also a skilled carver who could work with both wood and metal? That he was able manufacture his own fittings for his photography and items that he used in his studio? The charming nature of his work made them ideal for commercial applications. That led to Barber's virtual abandonment of landscapes including deer in favor of his more marketable depictions of children and animals. Even though his works would be primarily offered as chromo-lithographic prints, rather than sold as original oils, Barber continued to be an exacting artist. Barber's brother would tell one biographer that the sight of a blank canvas on which such a painting was destined would literally make Charles sick. He loved painting animals. Once the animal(s) had been added to the painting, he felt none of the pleasure that he enjoyed when painting a straightforward animal portrait. Though he disliked painting the subject pictures, he always remained true to his art. He was known to purchase wall-paper and attach it to a board so that its pattern could be incorporated into a painting he was working on. He also made furniture purchases for the same reason. 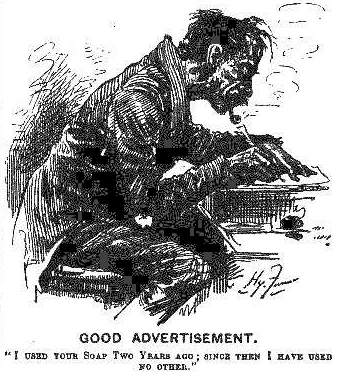 Harry Furniss, an artist perhaps most well-remembered for his contributions to Punch, or The London Charivari, mentions in his book, The Confessions of a Caricaturist that he was great friends with Barber. He laughs that there was nothing Bohemian about Charles and cited his being a non-smoker as an example. 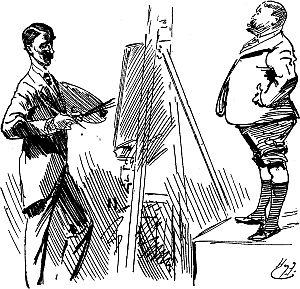 Furniss admits that to complete his popular Tramp drawing, shown here, that Barber sat for him as a model. Furniss tells a bit of a fun story about a time he modeled for Barber. It would seem Barber used Furniss to complete a painting for Queen Victoria. In the painting, John Brown was being shown surrounded by the Queen's dogs. The story goes that Barber was having trouble with John Brown's calves. 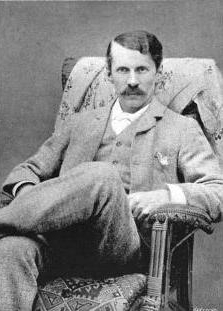 Furniss posed for Brown, who he refers to as “the brawny Scott”, but it was only his calves which were included in the painting. Furniss shares the moment in this caricature. The commercial application of his work was not limited to selling prints of his works to the public. Rival soap manufacturer’s A. and F. Pears and Lever Brothers both owned the painting entitled Suspense. (Lever most likely obtained the painting when they acquired Pears in 1916.) 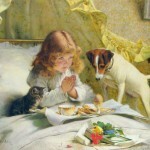 Suspense depicts a beautiful blue-eyed, blond little girl sitting in bed saying grace over her breakfast. She watches closely as her pet Jack Russell terrier stands on the bed next to her ready to pounce upon the meal. Seated on the opposite side of the girl is a small kitten who also looks ready to dive into the morning meal. In researching this article, it remains unclear if Barber’s painting was ever used to promote either company’s products. 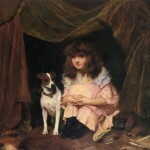 Barber’s paintings often depict children from wealthy homes and their loyal pets. 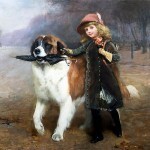 In Off to School we see a young girl walking to school with her pet St. Bernard. The dog is carrying the girl’s umbrella while appearing to protectively lead the girl to her destination. What is perhaps his most famous painting, In Disgrace, depicts a young girl standing in a corner being punished for breaking a vase and scattering flowers. Tucked under her skirts is her small pet dog appearing to share in her punishment, ever the loyal companion. In another of his famous works, Marco, we see either a very pampered or a very naughty pet Pomeranian belonging to Queen Victoria standing upon a table covered with a white linen tablecloth and set for tea. If you have a bit of a keen eye, you might pick up that some of the children, particularly the strawberry blonde little girl, and a number of the animals appear in more than one of Barber's paintings. While I am far from the first to pick this up, sadly I've not found any discussion as to whether or not the artist used his own children and pets as his models. There are some in the art world who question his skills as a painter and the fact he allowed his works to be mass produced for the masses. The rest of us greatly treasure this Victorian painter’s true talent in depicting the bond between pets and their owners. By maintaining the natural appearance of the animals, he instills in them all of the expressions, personality and emotion we see in our own pets. I can't be alone in my assessment that his paintings continue to be loved throughout the world. In fact, in 2007, In Disgrace was purchased for $639,964 and Suspense was purchased in 1997 for $442,500; both were sold by Christie’s. The photograph of Charles Burton Barber which I've included was published in The Magazine of Art which was published by Cassell and Company in 1896.